Gets me around like a charm. The TravelScoot gets me around like a charm. Negotiating isles and crowded areas was no more difficult than if I was walking through. I haven’t had this much fresh air in years. 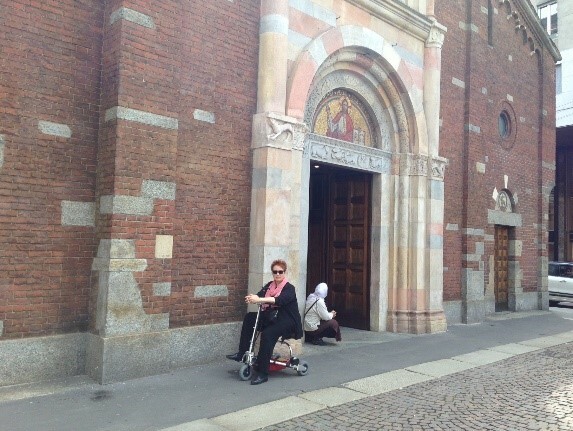 Here I am in downtown Milan last week. The scoot was brilliant, and I went everywhere with it. In and out of stores, over some pea-gravel paths and a fair amount of cobblestones – it was terrific. 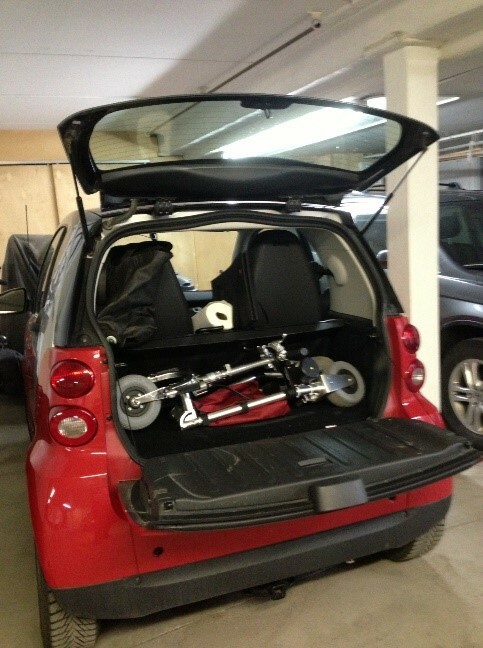 Here is a photo taken today, when I put the scoot in my Smart car without folding it. 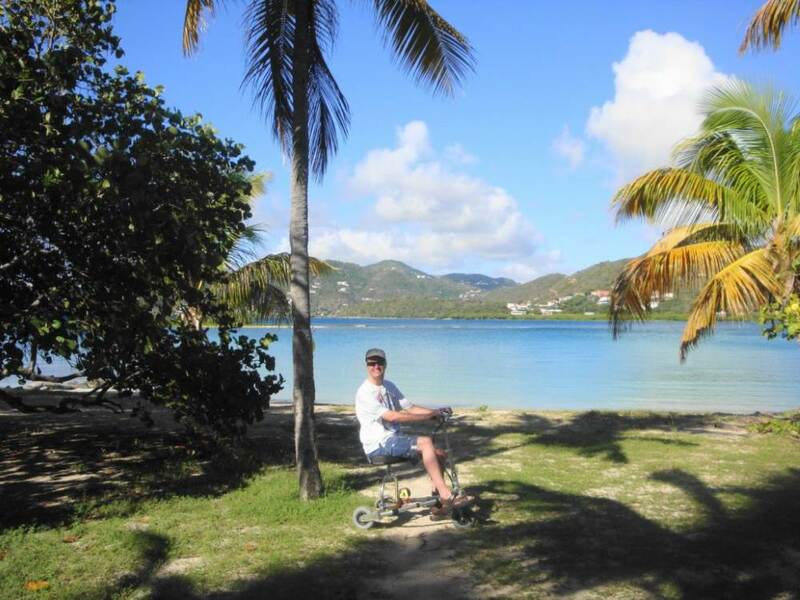 What a difference the TravelScoot has made to my life, not only on a cruise ship but at the shopping malls etc. It is so light I can lift it in and out of the rear of my car no problem. I take off now to malls and spends hours doing things that I couldn’t do for some time. I recently took my husband to Costco. He was stuck with the shopping cart while I scooted all over the store. Guess who was the most tired? TravelScoot has given me total freedom and a whole new life. I cannot tell you how much my TravelScoot has given me total freedom and a whole new life. 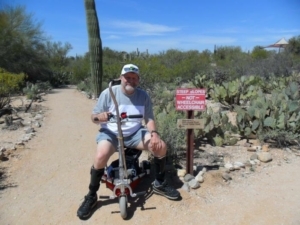 For the last thirty years my ability to walk long distances has been slowly diminished to where I could only walk a few blocks before I would have to give up. With my purchase of TravelScoot I now can go everywhere, even downtown in Victoria where we have accessible curbs. Also I have been able to explore my neighbourhood with my husband and enjoy the outdoors. I look forward to taking it on my travels. Thank you for this new found freedom!! I found the “Throttle Assist” a big advantage. We have just returned home from a six week holiday in Scotland. I took my TravelScoot with me and found it very handy. 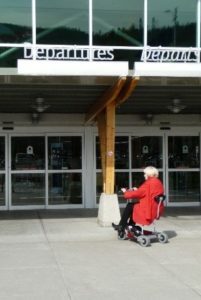 It saved a lot of waiting around for wheelchairs at the airports and I rode it to the door of the plane when leaving. On returning to Toronto, the scooter was at the door of the plane waiting for me. I found the “Throttle Assist” a big advantage. Saved my life in the gigantic land of Las Vegas. I can now scoot further than I could ever have dreamed of walking. My name is Connie and I’m 81 years young. I have trouble walking any distance as my knees aren’t what they used to be. It is very painful and sometimes give out without any notice. 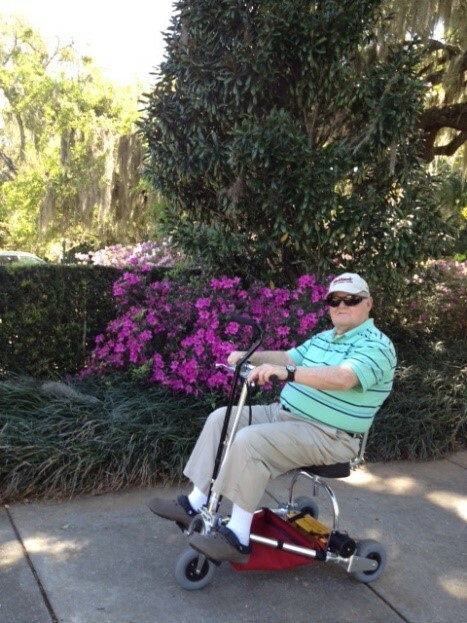 I’ve always been hesitant about getting a mobility scooter as I thought it would make me look older than I am. 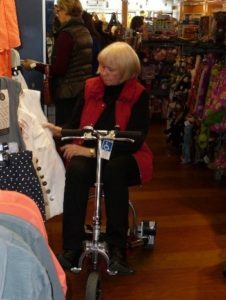 I first saw a TravelScoot while clothes shopping in the Bay. I couldn’t believe how it could scoot down the tiniest of isles. I thought to myself, now there is a pretty cool scooter. I looked it up online and decided to purchase one. It has been the best purchase of my life. I can now scoot further than I could ever have dreamed of walking. Everywhere I go, I get comments like “what a cute scooter” or “cool scooter”. The best part of all is I can put it into the back of my car without the help of anyone. I used to love to go to Butchart Gardens, I had to stop about 7 years ago because I couldn’t walk all the way around and felt “too old” to have my husband push me in a wheel chair. Besides, he can no longer push me that far in a wheel chair. Now that I have my TravelScoot, I go all the time. If time permits, I even go around the gardens twice! 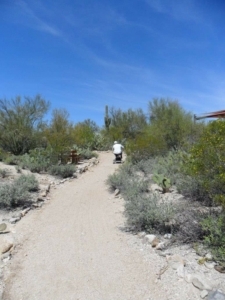 My TravelScoot has given me back my quality of life. To me, my TravelScoot is priceless and I wouldn’t trade it for anything. The difference in mobility is startling. I am significantly disabled due to a hip replacement and back problems. I can walk but only about 50 yards and then very slowly with a cane. We saw the online demo and since we travel a lot, including overseas, the TravelScoot seemed to provide an answer to my wife’s exasperation in trying to walk with me. It has fulfilled all expectations! We used it on a family vacation to Florida and the difference in mobility is startling. The scooter has fulfilled all expectations. It is easy to assemble and use. It really has made a life changing difference to our mobility. The TravelScoot has been the most portable and frankly one of the most reliable scooters she has owned. 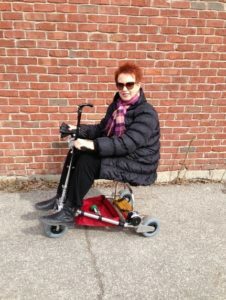 My wife Ellen is very pleased with the features and performance of the TravelScoot. She has been using scooters for over 20 years and has a great deal of experience with scooters of all sizes and models. The TravelScoot has been the most portable and frankly one of the most reliable scooters she has owned. We have put hundreds of kilometres on the unit, visited many countries by air and cruise ship. Portability is the TravelScoot’s best feature. 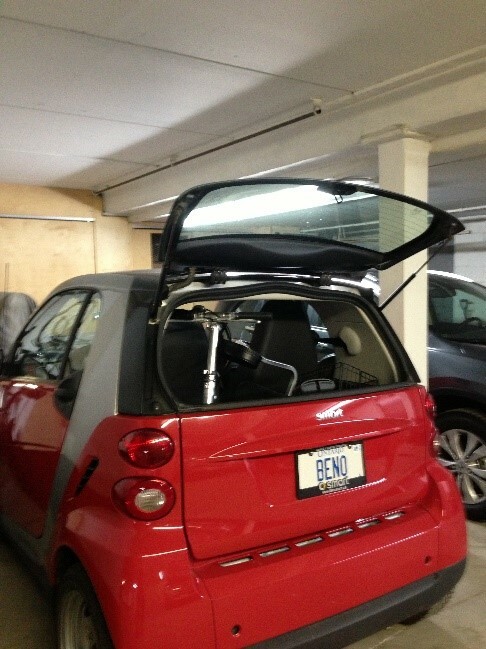 We have transported it in many rental cars as well as my wife’s PT Cruiser. She also likes speed, and the TravelScoot is faster than the competition. 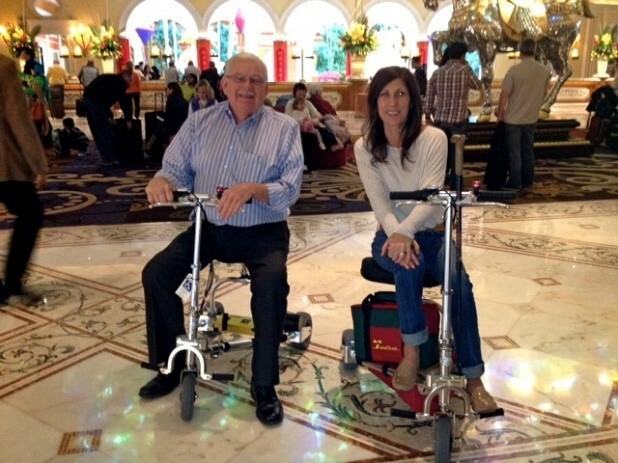 We used Go-Go scooters (two, because they didn’t last) before we found the TravelScoot. The TravelScoot is simply built and very little can go wrong with it. Thanks again for the TravelScoot and your good customer service. The TravelScoot caught my husband Tim’s attention because he has a very difficult time walking. He didn’t really like being pushed around in a wheel chair so often chose to stay home instead of being pushed around somewhere. We purchased the TravelScoot before a trip overseas. We were nervous about taking this new piece of equipment overseas as we were unsure how it would fit in cars over there. We were also nervous to leave the wheelchair at home. Long story short ….. it was the best decision we ever made. Right from the beginning, it made getting through the airport so much easier for both of us. Tim was independent (and loved the feeling! ), which allowed me to look after the luggage and everything else instead of pushing a wheelchair. It’s amazing how quick and easy it was for Tim to fold and unfold and put in the large carry bag. 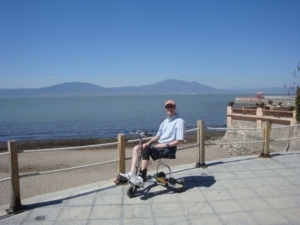 Tim did and went places in England that he would have never gone/done if it wasn’t for the TravelScoot. It was amazing. Cars over there are so much smaller than here, but it fit in even the smallest of cars there. After the TravelScoot experience in England, there was no hesitation in planning other vacations. We have been to The British Virgin Islands (3 planes to get there), New York and Mexico. Three places that we had never been before and don’t think we would have gone if it wasn’t for the TravelScoot. It has also made a huge difference to Tim going on short-distance trips and local places. Before he would usually say “no” (didn’t want to be pushed around in a wheelchair). However, since the TravelScoot he very rarely says “no”. When we have relatives visit us from England, he goes everywhere, Niagara Falls, ferry to the Toronto Island, baseball games, etc. It’s also great for trips to the mall and restaurants. We have a car with a regular trunk and Tim has no trouble getting it in and out of the trunk. Everywhere we go someone ends up stopping Tim to ask him about it. In summary, Tim (and I) are so pleased with the TravelScoot. I get the sense that their focus is on my mini scooter, not my disability. 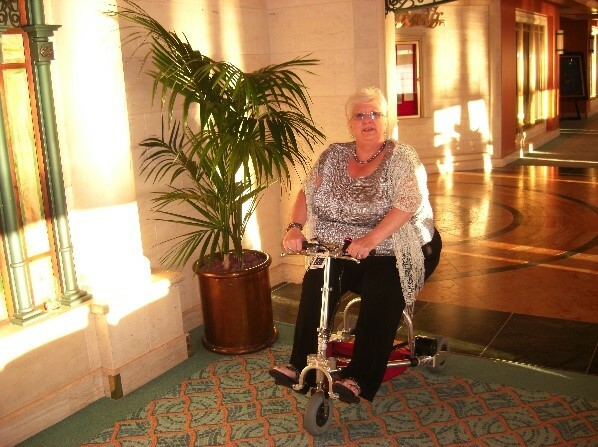 I am 67 years old, and was diagnosed with multiple sclerosis aged 20. In the past few years I have had difficulty in ambulation, and can only manage a short distance with the aid of a walker. I also have difficulty in standing unaided. Since buying the Travel Scoot last year my life has dramatically changed for the better. I now have independence in getting around. 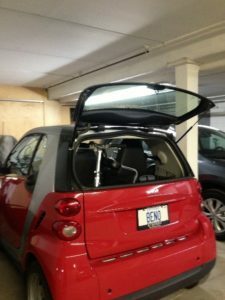 Because it only weighs 34 lbs, my husband is able to easily put it in the back of my car. 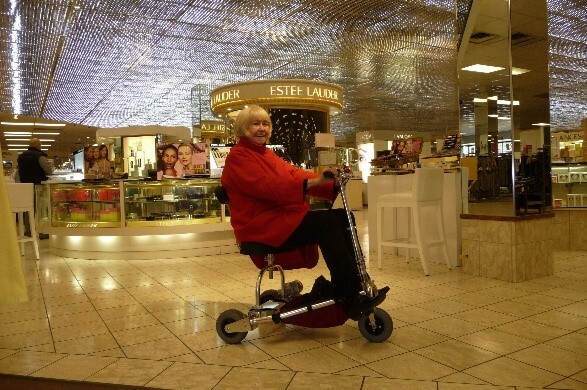 The Travel Scoot is so small, and light people often stop me, and ask me where I got it. I get the sense that their focus is on my mini scooter, not my disability. It has enabled me to travel further a field to my family in Sri Lanka 12,000 miles away. 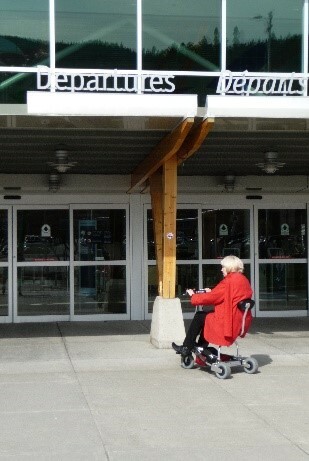 Large distances at the airport are easily navigated on my Travel Scoot. Moreover I am able to drive to the jet way, and embark directly onto the plane. The Travel Scoot is then transported in cargo valet service, and awaits me on disembarking the plane. With its disabled label I am always given priority. 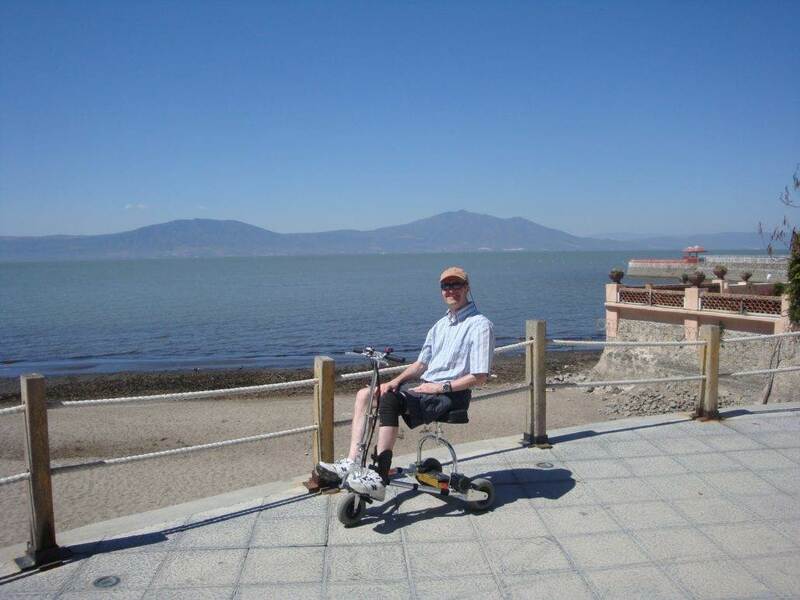 In addition, now, when we go cruising on our boat I am able to revisit all those wonderful places that we so enjoyed before I became disabled. Without my Travel Scoot I would be stuck at home, and this why It has changed my life so dramatically. The TravelScoot made all the difference in my holiday and I took it places I didn’t think I could including street cars in Melbourne. It went up hills steeper than I thought it could. Air Canada had no trouble with it and I don’t think I was ever close to running the battery down. Here’s an anecdotal story that you might not want to print. Coming out of the theatre on the ship one night around 11:30 pm, two young girls (in their late 20’s I would say) thought the scooter was quite cute and wanted a ride (I think they’d had a few drinks). I’m 59 but one of my friends who was on the cruise with me has a picture of these two, one sitting on each leg with my face in the middle. They said “bring your friends to the disco.” I pointed out that one of the people they referred to wasn’t my friend – it was my wife! It was all pretty funny. So there’s another marketing angle for you – the scooter can help you pick up women! Kidding aside, it was great and made an enormous difference for the entire cruise.